Now wouldn't it be great to have your pet sleep and stay on his own "dog bed" ? This is a great way for your animal friend to feel comfortable and feel loved in his own spot. 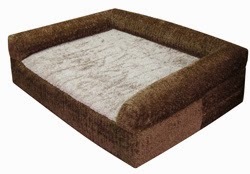 The orthopedic dog bed of the moment is this beautiful plush plain medium neutral with spice bolster bed. The sizes range from mini to x-large to accommodate any sized dog or cat! YES, these beds came be for cats too!!! Click here to see the FULL LINE of our various supreme bolster beds as featuried on Smart Pet Beds.